Thibaut Courtois has just left Chelsea for a transfer to Real Madrid and is already seeming to drop subtle hints Eden Hazard’s way about his old team-mate following him to the Bernabeu. 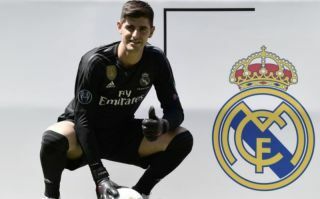 The Belgian shot-stopper looks a superb signing for Los Blancos after a protracted transfer saga that saw him run down his contract into its final year at Stamford Bridge. Courtois spent time in La Liga earlier in his career and clearly enjoyed his three-year loan stint with Atletico Madrid as he’s made it publicly quite clear he’d like to return to the Spanish capital on a number of occasions since then. This summer has been a difficult one for Chelsea as Hazard has also at points been linked with a potential switch to the Bernabeu. The Daily Mail were among the sources linking Hazard as a target for Madrid earlier this summer, but those links have died down somewhat in recent times. Still, Courtois is obviously keen to be reunited with his fellow countryman at some point in his career, and wasted no time sending him that message with these comments circulating on Twitter. CFC supporters will likely be angry enough with their former ‘keeper as it is, so him going about tapping up another of their best players immediately after moving to his new club will not go down well.